Borne of the earth, stone adds a touch of drama and gravitas to these lighting pieces. Designed by Carlo Colombo for Italian lighting brand Penta, the Je Suis lamp features a base of Carrara white marble, with orb-shaped shades in white blown glass and silver, or in transparent blown glass and silver. Available as a table lamp and floor lamp, Je Suis brings to mind a fortune teller's crystal ball or a wizard's sceptre. New York-based designer Lindsey Adelman's lighting pieces are as much installation art as they are a source of brightness. 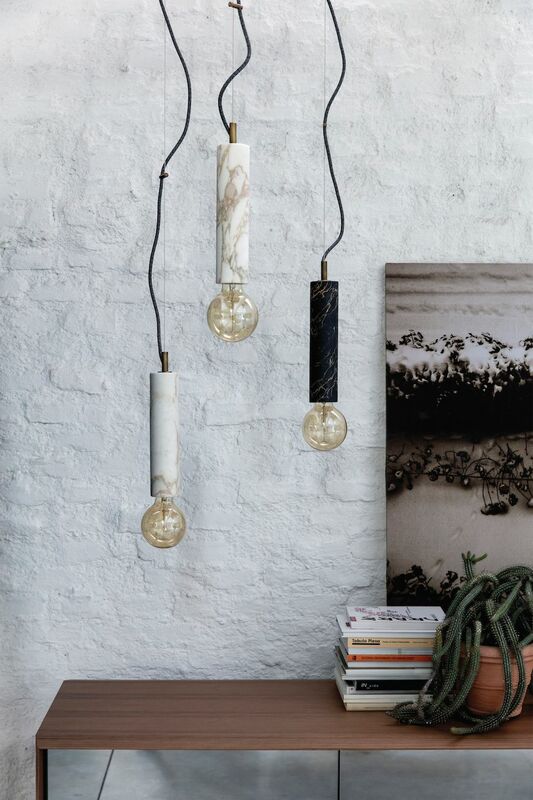 The Edie marble chandelier, designed by Mary Wallis for Adelman's studio, is created with bevelled marble shards; it is available in satin nickel with black marble or brushed brass and exquisitely grained white marble. A block of orange-veined green onyx glows when light from a neon hoop attached to the top section shines through it. Designed by Sabine Marcelis for Bloc Studios, the Voie light series resulted from an investigation into light-path manipulation. Karl Zahn's Demeter 02, designed for Roll & Hill, was inspired by the scales of the Greek goddess of harvest and agriculture. With a half-sphere marble base, moveable transversal and two half-capsule shaped diffusers, this graceful table lamp comes with an integrated cord dimmer, and is available in finishings of bronze and brushed brass. Composed of a black or white turned-marble structure, with a steel ceiling support, the Eolo suspension lamp from Italian brand Porada is a striking illumination source that is classical yet surprisingly modern. Italian lighting brand Nahoor presents two table lamps that double as eye-catching accessories. The Cubo (pictured) combines Carrara marble with a wood or brass finishing to create a lamp akin to a work of art, while the Yuma table lamp uses brass and onyx for a sleek, opulent piece. Made of Carrara marble, aluminium and brushed nickel, Italian brand Tato's Quattrolati table lamp was created by Czech-born, Amsterdam-based designer Hisham Kulhanek. Resembling a square frame with rounded corners, it has a bulb incorporated into one side of the frame's inner surface, its glow illuminating the other three sides, reflecting and spreading the light. This story was adapted from Singapore Tatler Homes October-November 2017.